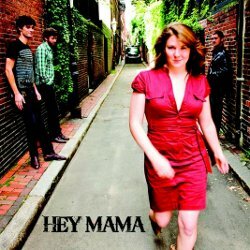 Hey Mama, a band currently based out of Boston, is a culmination of the howling roots-music duo Avi & Celia accompanied by some of the most incredible local players, each in their own right a direct descendant of traditional American folk music. That tip of the hat to history creates a powerful translation to the self-proclaimed "contemporary rock & roll" that the band expresses in their self-titled debut. I can't discuss the album without mentioning several things first. I've been especially fortunate to see the duo, Avi & Celia, perform on many occasions, often sitting in the corner of a dimly lit pub, each with a guitar in hand, accompanied by a group of raucously entertaining string players. Their brand of folk spans the spectrum of roots music, ranging from the deepest treasures of Americana and Bluegrass to the more modern delicacies of Blues and Rock. That said, as Hey Mama, the confines of themed acoustic music are shattered in an explosion of electricity, allowing for a more progressive vibe to hammer their traditional influences home. Celia Woodsmith, be it with either guitar or washboard in hand, commands immediate attention with a voice as earthy as it is beautiful, howling intensely throughout the album, and invoking the thoughts and passions that only true roots music can communicate. With Avi Salloway acting primarily as a harmonic highlight to Woodsmith's vocals, he is able to pour more of his immense talent into the electric guitar, opening up in ways that are otherwise tempered in the acoustic setting. The mastery of the sound on the album achieves the warm, full atmosphere that makes the listening easy and allows their efforts to fall seamlessly into any musical collection. With Ben Kogan and Jared Seabrook rounding out the band on bass and drums respectively, the quartet is further able to expand the sound with appearances by guest musicians Alex Speigelman on saxophone, and the Tecumseh Strings -- a trio whose contributions are brilliantly arranged by Salloway. As much as Hey Mama pays tribute to the traditions of music that came before them, the album is undeniably modern, and the energy inherently infectious. While their live performance stirs gasps and yelps, along with life and laughter from the audience, the effort put into the album effectively reflects the very essence of the electricity they have created by plugging in. And that, my dear friends, is something we can all tap into.